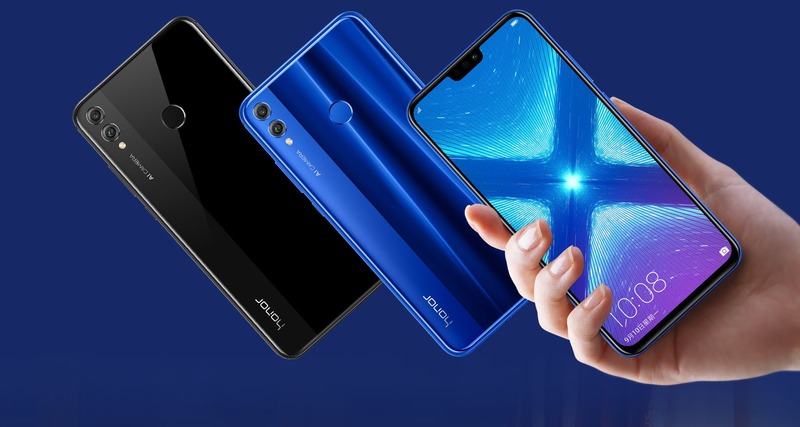 After launching the impressive Honor Play in various Global markets, the company is ready to launch a mid-range smartphone soon in markets like India, Spain, Russia etc. Launched a month back in China, the Honor 8X is launching in India on October 16. Considering how cheap the Honor Play with Kirin 970 was launched in India, expect really good pricing for the 8X in India. The Honor 8X comes with a beautiful glass and metal build that makes it look and feel premium. There is an edge-to-edge display on the front with very minimal bezels all around. The chin on the bottom is also pretty small. Fun Fact – The screen-to-body ratio of the 8X is higher than that of the OnePlus 6 and the Galaxy Note 9. The phone doesn’t have a waterdrop notch like its big brother 8X Max but has a smaller notch than most of the phones launched in its price range. We hardly see any Android phone with a chin that is just slightly bigger than rest of the bezels in the mid-range price segment. The 3.5mm headphone jack, micro USB port and the speaker grill are placed on the bottom. Yes, the phone still has the micro USB port. It would’ve been great to see a USB Type-C port. The Honor 8X has a big 6.5-inch display with a resolution of 1080×2340, i.e., Full-HD+. Under the hood, there is the Kirin 710 processor. It is the best mid-range processor that Huawei makes right now and competes with the likes of Snapdragon 660 and 670. It is an octa-core processor with 4x Cortex A73 and 4x Cortex A53 cores. There is 4/6GB RAM and 64/128GB internal storage. There is also an option to expand the storage up to 400GB via micro SD card. On the rear, the 8X has a dual camera setup with a primary 20MP f/1.8 sensor and a secondary 2MP depth sensor. On the front, there is a 16MP camera with f/2.0 aperture. The Honor 8X has a big 3,750mAh battery underneath which can be charged via the normal 5V/2A charger. Android 8.1 Oreo runs out of the box with EMUI 8.2 on top. We don’t know what the pricing is going to be for the Indian market but talking about the price for the Chinese market, the 4GB + 64GB variant is priced at 1,399 Yuan ($205 / Rs 15,000), 6GB + 64GB variant at 1,599 Yuan ($234 / Rs 17,000) and the 6GB + 128GB variant at 1,899 Yuan ($278 / Rs 20,000). Considering that the Honor Play with Kirin 970 is priced at Rs 19,999 in India, expect the price of the Honor 8X to remain well under Rs 15K for the base variant. This way, it will be competing with phones like the Realme 2 and the Xiaomi Mi A2.